Nie Yan and Tang Yao walked into the building. The walls which were covered in cracks looked like they could collapse at any moment. Many NPCs were stationed inside. All of them wore desert clothing with hoods that draped over their faces. They sold a variety of consumables and crafting materials, all of which were local specialties. Nie Yan led Tang Yao past these NPCs to a remote corner in the back, where they stopped in front of a shabby wooden door. Behind it was a narrow underground passageway. “Let’s go,” Nie Yan said as he walked down. “Where are we going?” Tang Yao asked. The passageway was so dark he couldn’t even see his feet. He could only rely on his other senses to follow Nie Yan. “We’re going to an NPC to buy a few scrolls,” Nie Yan replied. His ability to see in the dark had greatly improved thanks to Empress Finas’ Fate Pearl. His pupils narrowed into vertical slits and emitted a faint blue glow. Everything in the passageway became as visible as day. “Oh! So we’re just buying scrolls!” Tang Yao breathed out a sigh of relief. However, he couldn’t help but think this NPC was too secretive. Without prior knowledge, this place was almost impossible to find. Perhaps only one or two players would occasionally stumble across it. Secret NPCs were abundant in Conviction. They could be found in remote locations across every town and city. Trembling Milo back in Calore and Scroll Master Davina, who Nie Yan and Tang Yao were currently visiting, were examples of such NPCs. They often sold goods that couldn’t be found in regular shops. Scroll Master Davina was an eccentric woman. There were many rumours related to her floating around in this desert town. But little did everyone know that she was actually living below the town! Her temperament was odd. No one wanted to associate with her. She restricted the number of scrolls that could be purchased from her to 10 a day. If they tried to buy more, she would shoo them away with a nasty attitude. The items she sold were quite rare. Occasionally, some amazing items would emerge. Players were often able to get many good things from this place. After walking through the passageway for several minutes, they saw a dim light up ahead. “We’re here,” Nie Yan said, his pupils returning to normal as he walked toward the light. He surveyed the surroundings and saw a cramped room roughly 3 by 5 meters in size. The walls were lined with shelves filled with different kinds of scrolls, many of which were only half finished or incomplete. A desk and chair stood in the middle of the room. The remaining space could only accommodate two or three people at most. Scrolls were chaotically scattered across the floor. Sitting behind the desk was a person in black robes which hid her appearance. All that could be discerned was that she was a woman. Her pale white hand was holding onto a slender ash-gray pen. She was scribbling on a piece of parchment, inscribing all sorts of strange runic patterns. She was buried under a pile of scrolls. Her figure was solitary as if she was cut off from the rest of the world. “She sells the scrolls?” Tang Yao asked. He was about to take a step forward. Stopped by Nie Yan, Tang Yao’s foot remained hovering midway through a step. Nie Yan bent down and started picking up the scrolls on the floor. 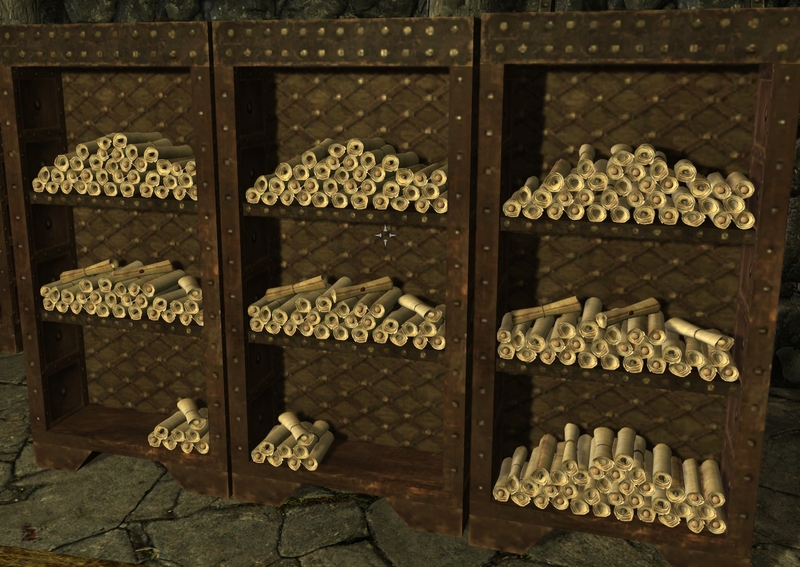 With a pile of scrolls in his arms, he walked toward the shelves and started putting them away in an earnest manner. Scroll Master Davina continued scribbling on the piece of parchment, ignoring Nie Yan. In the previous timeline, when players discovered this place they boorishly stepped atop these scrolls. Not only did Scroll Master Davina refuse to sell them anything, she even drove them out of her dwelling. This was a hidden requirement. Players had to show Scroll Master Davina enough respect to purchase her scrolls. Picking up the scattered scrolls on the floor was Scroll Master Davina’s test for Nie Yan and Tang Yao. Tang Yao quickly picked up on what was going on. He began helping Nie Yan clean up. Before long, all the scrolls were neatly ordered on the shelves, and the room looked a little tidier. Only now did Nie Yan and Tang Yao approach Scroll Master Davina. “What do you need?” Scroll Master Davina asked in a hoarse voice. Nie Yan browsed through the list of goods she had for sale. There were over 60 types of scrolls, including single-target spell scrolls, group-target spell scrolls, and all sorts of rare magic scrolls. There was no lack of quality. Some scrolls which sold for several hundred gold in the marketplace could be found here for under 50 gold. Scroll Master Davina sold a maximum of 10 scrolls a day, limiting Nie Yan’s choices. His eyes quickly locked onto a certain scroll. Nie Yan directly bought 10 of them for 200 gold. Spending so much money at this time slightly pained Nie Yan’s heart. However, this quest couldn’t be solved by just spending 200 gold. “What scrolls did you buy?” Tang Yao asked. Looking at all the scrolls up for sale made his head spin. Every single one of them was a good item, only that their prices were a bit expensive. Some of them even cost upwards of several hundred gold! “I bought 10 Advanced Twisting Vines Scrolls,” Nie Yan replied. He bought these scrolls primarily to complete the quest. “Only 10 Advanced Twisting Vines Scrolls? Nothing else?” Tang Yao asked in surprise. There were so many scrolls here. Every single of them was quite useful. Why only buy Twisting Vines Scrolls? “Let’s go, we can buy more scrolls next time,” Nie Yan said as he brought Tang Yao out of Scroll Master Davina’s dwelling. In the previous timeline, very few people knew of Scroll Master Davina’s existence. He had only learned about her from a friend. Due to Davina only selling 10 scrolls a day, some people would scramble to get here at the start of the day to buy them. There were too many monks and not enough gruel, so most would fail at buying a scroll. Nie Yan had only managed to snag a few scrolls in his past life, so his impression of Scroll master Davina wasn’t that deep. Only after having to do this quest did he recall he could buy what he needed from her. Nie Yan thought for a moment. Should he have Guo Huai send someone to buy scrolls from here every day? He would make quite a profit by selling them in the marketplace. For example, an Advanced Twisting Vines Scroll could easily net 60 gold. The only problem was that if these things were put up for sale, it would attract a lot of trouble. If an enemy bought these scrolls, only to use it against them, that would be quite depressing. He could first store these scrolls in the treasury. If Asskickers United was really hurting on funds, he could take them out to sell. Nie Yan notified Guo Huai about purchasing scrolls from this place. He and Tang Yao exited the town and got on their mounts. The two of them galloped away, leaving behind a trail of dust. “The center of the desert, Colin Gobi,” Nie Yan replied. The Colin Gobi was a region of death in the desert. Nie Yan had learned some background information about this place in the previous timeline. It was originally just an ordinary desert, but became a haunted wreckage site after a Colin Airship was shot down by a squadron of Viridian Empire Griffon Knights over this place. The airship fell from the sky and crashed into the desert, spreading wreckage and debris everywhere. All sorts of broken frames could still be found to this day. There was a famous boss in this area called Phantom Princess Ina, a Level 60 Lord-class monster. She didn’t have any attacks, but she could summon powerful Evil Mages, ranging from 20 to 30 at a time. She respawned once a day. In the previous timeline, many people came here to fight her. If you passed this place, you would often see a vast ocean of players. Looking ahead, large pieces of debris were scattered about. Some of them were over 30 meters high. Some wreck sites only covered a small area, but this one covered an entire desert. One could imagine how magnificent the Colin Airship was! You have discovered the Colin Gobi. “Windchaser. It increases movement speed by 80% for 120 seconds. I can only use it on myself though,” Tang Yao replied. This was his only speed boosting spell. Haste-type spells for Mages gave a relatively large boost. However, an 80% speed boost for a Mage wouldn’t even equal a 30% speed boost for a Thief. Nevertheless, Windchaser was good enough. “Windchaser? Not bad, follow me. Drink an Invisibility Potion,” Nie Yan said before entering stealth. Tang Yao drank an Invisibility Potion and followed Nie Yan. After moving for a while, they spotted swarms of phantoms in the distance. They were in a shadowy state. Their faces weren’t clear. Nie Yan was only 20 meters away from them. He didn’t dare to use Transcendent Insight to inspect them. The level difference was too high, so they might discover his existence if he did. After passing through this area, Nie Yan spotted seven large phantoms up ahead. They were roughly 3 meters tall and held large iron mallets. They appeared valiant and fierce. They were famous Phantom-type monsters in the previous timeline, Phantom Berserkers, Level 60 Elites that ignored physical attacks. They didn’t have much health. But since they were immune to physical attacks, Warriors couldn’t hold their aggro. They would often shift targets and start madly pursuing the Mages. After killing all the Mages, the remaining melee class players were doomed because their attacks were useless against the Phantom Berserkers. In the previous timeline, countless teams were wiped out by these Phantom Berserkers.